Media research firm IPSOS has found that twice as man Americans are streaming TV shows and movies as were doing it a year ago. In the past 30 days, 26% of online Americans have streamed a full-length TV show and 14% have streamed a full-length movie. This is more than two times the levels measured in September 2008. Young adults 18 to 24 years of age are the most ardent supporters of this medium. In the past 30 days, 30% have streamed a full-length movie and 51% have streamed a full-length TV show, which represent dramatic increases from last year. 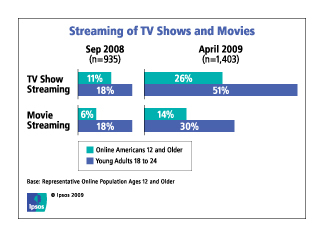 Despite the popularity of Internet television, people still have a clear preference for viewing video on their televisions rather than a computer. Currently, the average American with Internet access watches 15 hours of television per week, compared to less than two hours on their PC. Even among digital video users, 64% would rather watch hour-long dramas and half-hour comedies live on their TV than rent or purchase them, or watch them on their PC or portable device.